Capturing fear can be difficult because you must consider all aspects of the fear– both physical and emotional. My job as one of the artistic leads is to analyze, create, and implement the many elements of fear in order to produce a strong reaction from the audience. The fear we hope to capture is one of the most classic and revisited classifications: the childhood nightmare. When thinking about the nightmares we had as kids, many are able to distinctly recall the monsters who we imagined lived under our beds or in our closets, patiently waiting until sundown to haunt us in our sleep. 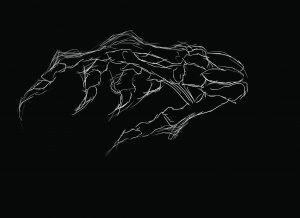 When you visualize the emergence of this monster, what is the first thing you notice? Is it its menacing red eyes that glare at you from across the room and stare blankly and threateningly into your soul? Or perhaps its his sharp, rotting teeth that it exposes only to present a hideously evil smile? In my opinion, it is the hands. To most, hands are a very mundane aspect to the human body. However, hands produce a kind of emotion that is unable to be captured through other parts of the body. They tell a story. Hands are usually associated with touch and comfort. Not in this case. The hands of the Horned King need to tell the story of a monster desperate for power. They need to be rotting from intense desire. His bones need to be protruding from his discolored skin that surround his claws infested with dirt and grime. We want the audience to squirm from the thought of having his hands brush over their face. So how did we create these terrifying hands? We started with concept art. This is just a rough sketch of how we wanted the end product to look. As you can see, it exaggerates the protruding bones and sharp claws. During later prototypes, we revised this concept to include rotting colors such as greens, blacks, and browns. Then we moved to prototype 1. 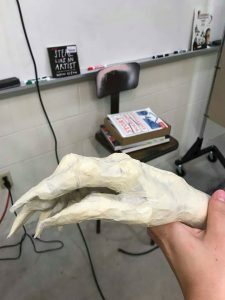 This is the first prototype of the hands. They were very small scale and were made out of just wire, crumpled up paper, and masking tape. Surprisingly, the masking tape gave us a very nice rotting texture that we would eventually use in later prototypes. We went over the masking tape with acrylic paint to perform a color test. We were happy with the green and brown tones and decided to continue this color scheme throughout the course of the project. Like the first prototype, the second prototype also just used paper and tape. This one, however, followed anatomy more closely. We were also more strategic about the placement and direction of our tape in order to make “cracks” in certain areas and emphasize bone structure in others. In addition, I improved the paint strategy by being more meticulous with the employment of shadows and highlights. At this point in the process, we were so happy with realization of Prototype 2 that we decided to recreate it for the final product. Unfortunately we ran into a major problem during while creating our final gloves: The tape wouldn’t stick to the gloves (oops). We had to adapt and come up with a different solution. Eventually we decided modeling paste would be the most effective solution. 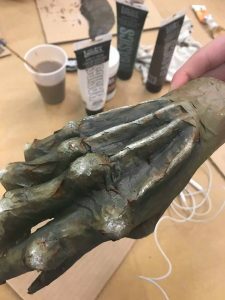 We layered the paste on the glove to resemble the bone protrusions and added additional layers to serve as our rotting texture. 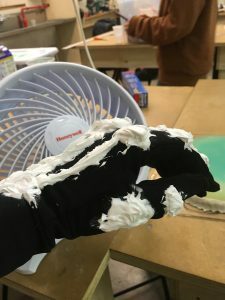 After drying, we added our many layers of acrylic paint and used the cracks in the dry modeling paste created by bending our hands in the glove to our advantage. 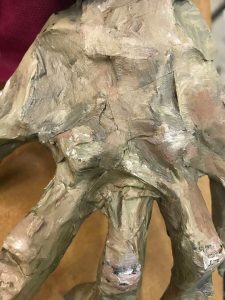 We accentuated every crack and crevasse with shadows and highlights to construct some truly disgusting Horned King hands. 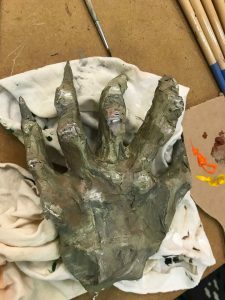 We are excited to eventually add claws and use these hands to reintroduce a childhood fear to our audience!